Picture subtropical south-central Texas, where the Balcones Escarpment Fault meets the Colorado River. This is where Texas’ capital city of Austin is located. 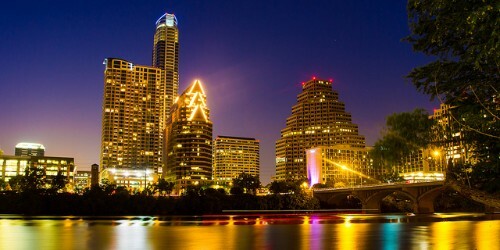 This city’s motto is “Keep Austin Weird.” A liberal city in a conservative state and hub of independent businesses in a chain-driven market, Austin is known for standing out from surrounding locales. Austin’s music identity is equally incongruent. With blues, rock, and country in regular rotation and festivals pulling less popular genres into town, Austin is a music haven. Keep reading to find out what makes Austin the self-proclaimed “Live Music Capital of the World.”..
2019 Event Tickets for Austin Concerts are on sale now! Often, concerts are an 18+ or even 21+ activity, baring out those who are not the age of majority and those who are not of legal drinking age. Since majority of music venues are bars that host concerts at night, these restrictions are used to cater to the clientele. However, this means that younger listeners across the United States are forced into makeshift underground communities to experience music. Contrary to this standard, in Austin, young folks do not need to find basements, backyards, garages, and fields to appreciate music. Austin’s tourist-focused music scene caters to families, too. Some events that focus on family affairs include Texas Radio Live, Blues on the Green, KUTX Live at Mueller, and Unplugged at the Grove. Because Austin has sunshine 300 days a year, the family-friendly outdoors events range from year-round to seasonal. Texas Radio Live is a weekly Wednesday favorite; hosted at Guero’s Taco Bar, the family can experience Tex-Mex while listening to local, regional, and national acts. For festival fans, do not forget to look into the Austin City Limits Music Festival for the kids’ stages and kids’ events, including crafts and workshops. For Concerts in Austin, please see our event listing calendar of Concert tour dates in 2019! They say that everything is bigger in Texas. Maybe it's because the state is the second largest in the union, or maybe it's because Texans have enough ego to stand up to their state’s size. Either way, one way Austin does it up big is with their nightlife. A number of establishments have partnered to combine food with live music, ensuring that listeners never go hungry. Although recent studies show that Austin’s live local music scene is dwindling—much like the rest of the United States—many of its venues are still standing and lining up acts regularly. Listeners can expect other forms of entertainment, such as quality food and drink, as businesses compete to keep people coming back. Many cities claim to represent diverse perspectives in music, but few deliver on the promise quite like Austin. The city is home to the world-class Texas Music Museum, “celebrating the diverse traditions of Texas music.” Its current exhibits are “Texas Country Western Music Legends” and “Contributions of East Austin African-American Musicians to Texas Music.” This museum does more than educate within its walls; it also plays a role in the local music scene, organizing events such as the International Music Festival, which is on its 8th year. Concert lovers who like educational, diverse, international music will be invigorated by the concerts in Austin brought to listeners by nonprofits like the Texas Music Museum. How Do I Find Upcoming Austin, Texas Concert Events Near Me? See below for a list of Concerts in Austin TX scheduled for 2019.